By now we are all more than familiar with the “alternative” shades of gold present in the luxury watch market. Rose gold has developed a plethora of nicknames such as: pink gold, red gold, not to mention the obscure “magic gold” and “king gold” from Hublot. All of which provide a unique alternative to the traditional yellow gold options presently on the market. This unique shade of gold has rapidly become the preferred non-silver metal for many. As with many contenders in the marketplace, Rolex developed its own proprietary version of pink gold—aptly named Everose—which was unveiled for the first time in 2005 on the Rose Gold Cosmograph Daytona. Fancy nomenclature aside, there are a few key differences to Rolex’s proprietary pink blend that set it apart from the pack. The Rolex Everose Gold watches from Rolex have a secret ingredient. Aside from the usual suspects (copper to add its pinkish hue, as well as a hint of silver), Rolex also adds just a touch of platinum to its Everose formula as well. The benefits of this special combination prove to be twofold. On one hand, platinum acts as a bonding alloy of sorts, ensuring that its pinkish tone does not fade over time. Generally, exposure to the elements (UV, saltwater, sweat, etc.) will cause the copper in pink gold to react, which is exactly what Rolex set out to counter with its Everose formula. While we don’t doubt that other brands are also taking some sort of action to accomplish the same result, after 13 years on the market thus far it seems Rolex’s alloy is living up to every expectation. That in mind, here are some of our favorite Everose watches from the Rolex archives. 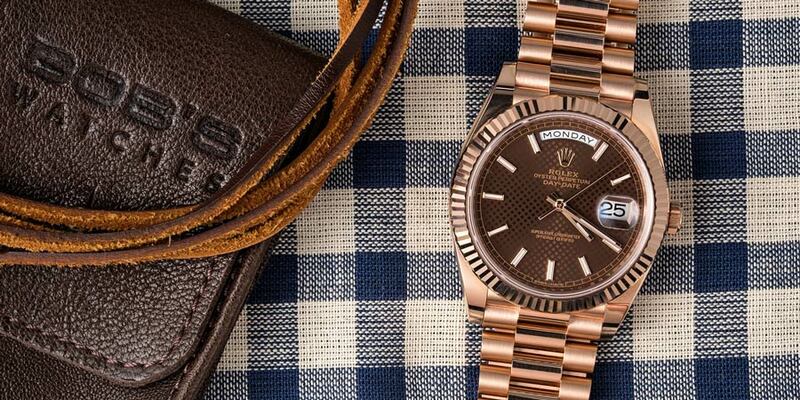 Keep time perfectly with this Rolex Everose Gold. This particular execution of the everose Rolex President is the ultimate example of how Rolex can deliver a watch that’s both understated and impactful all at the same time. The combination of a 40mm Everose case and bracelet and a rich chocolate brown dial are an unexpected pairing that works incredibly well together. Much like we loved it on the ceramic Daytona we wrote about last year, the color combination is a real home run. Unlike said Daytona though, the President Day Date seen here, doesn’t have the dark black accents for its indices and bezel, instead taking advantage of the crisp sparkle provided by baguette diamond-set hour indices. In photos you would almost mistake these diamonds for applied platinum or silver indices, though in natural light they’re a real eye-catcher. 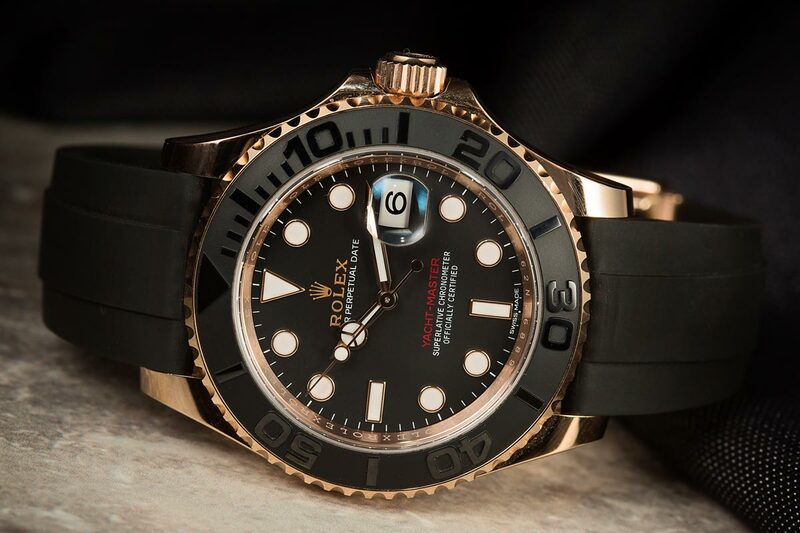 The Rolex Everose Gold Yacht-Master is a hot watch and in high demand on the market. Out on the much more casual end of the spectrum, the Rolex Yacht-Master in Everose is a special breed of diver, primarily on account of its precious metal construction. While most are used to steel or titanium-cased tool divers, the Yachtmaster’s textured Cerachrom bezel and Everose gold case give it a much more refined look without compromising its utilitarian and functional design. The biggest selling point with the launch of this new Yacht-Master was the creation of the Oysterflex bracelet—a rubber strap with internal metal supports designed to ensure greater overall longevity, as well as providing a more breathable fit on the wrist than what’s seen from most conventional rubber straps on the market. 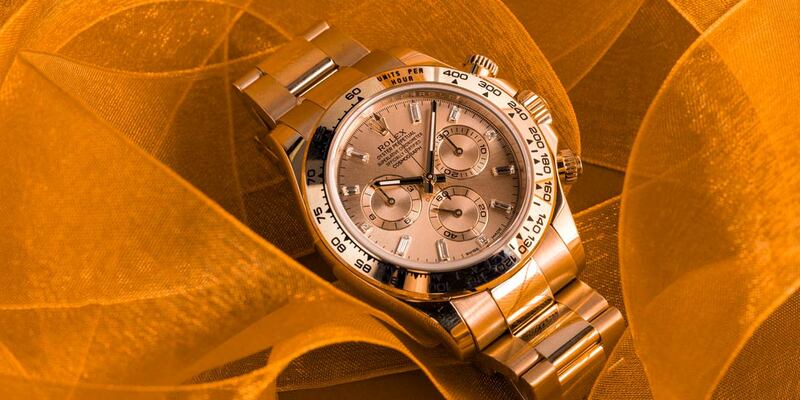 A full Rolex Everose Gold Daytona. Comment your thoughts below! Though we previously made mention of the more recent Everose Daytona with a Cerachrom bezel and chocolate brown dial, this stunning monochrome Everose Daytona 116505 is in a different league altogether. Most often we’re fans of seeing a certain level of contrast with a chronograph’s subdials, though in the case of this 2011 release, said contrast is achieved through a subtle circular etched pattern in the subdial rings. 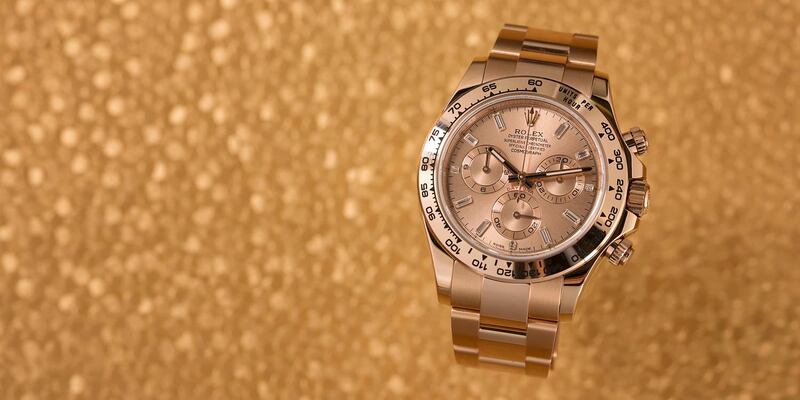 Its bezel is of the pre-ceramic era, however, the overall look of this gold-on-gold Daytona is incredibly timeless, ensuring it will remain immensely desirable as the years (and decades) pass. Like its Presidential sibling we previously mentioned, the Everose gold Daytona uses applied baguette diamonds of varying length for its hour indices (other than the mighty gold crown at the 12 o’clock position.